After Muhammad’s death in 632 CE, there were conflicts among his followers as to who would become his successor, which created a split in Islam between the Sunni and Shi’a sects. After Muhammad ‘s death in 632 CE, his friend Abu Bakr was named caliph and ruler of the Islamic community, or Ummah. Sunni Muslims believe that Abu Bakr was the proper successor, while Shi’a Muslims believe that Ali should have succeed Muhammad as caliph. After Muhammad’s death and the rebellion of several tribes, Abu Bakr initiated several military campaigns to bring Arabia under Islam and into the caliphate. The Rashidun Caliphate (632–661) was led by Abu Bakr, then by Umar ibn Khattab as the second caliph, Uthman Ibn Affan as the third caliph, and Ali as the fourth caliph. Muslim armies conquered most of Arabia by 633, followed by north Africa, Mesopotamia, and Persia, significantly shaping the history of the world through the spread of Islam. Sunni: The branch of Islam that believes that a caliph should be elected by Muslims or their representatives and that Abu Bakr was the first caliph. Ummah: An Arabic word meaning “nation” or “community;” usually refers to the collective community of Islamic peoples. Shi’a: The minority Islamic branch that believes Muhammad appointed his cousin Ali as his successor and that the caliph should be decided based on this family lineage. caliph: The head of state in a caliphate, and the title for the ruler of the Islamic Ummah; a successor of Muhammad. Muhammad united the tribes of Arabia into a single Arab Muslim religious polity in the last years of his life. He established a new unified Arabian Peninsula, which led to the Rashidun and Umayyad Caliphates and the rapid expansion of Muslim power over the next century. With Muhammad’s death in 632 CE, disagreement broke out among his followers over deciding his successor. Muhammad’s prominent companion Umar ibn al-Khattab nominated Abu Bakr, Muhammad’s friend and collaborator. With additional support, Abu Bakr was confirmed as the first caliph (religious successor to Muhammad) that same year. This choice was disputed by some of Muhammad’s companions, who held that Ali ibn Abi Talib, his cousin and son-in-law, had been designated the successor by Muhammad at Ghadir Khumm. Ali was Muhammad’s first cousin and closest living male relative, as well as his son-in-law, having married Muhammad’s daughter Fatimah. Ali would eventually become the fourth Sunni caliph. These disagreements over Muhammad’s true successor led to a major split in Islam between what became the Sunni and Shi’a denominations, a division that still holds to this day. Sunni Muslims believe and confirm that Abu Bakr was chosen by the community and that this was the proper procedure. Sunnis further argue that a caliph should ideally be chosen by election or community consensus. Shi’a Muslims believe that just as God alone appoints a prophet, only God has the prerogative to appoint the successor to his prophet. They believe God chose Ali to be Muhammad’s successor and the first caliph of Islam. After Muhammad’s death, many Arabian tribes rejected Islam or withheld the alms tax established by Muhammad. Many tribes claimed that they had submitted to Muhammad and that with Muhammad’s death, their allegiance had ended. Caliph Abu Bakr insisted that they had not just submitted to a leader, but joined the Islamic community of Ummah. To retain the cohesion of the Islamic state, Abu Bakr divided his Muslim army to force the Arabian tribes into submission. After a series of successful campaigns, Abu Bakr’s general Khalid ibn Walid defeated a competing prophet and the Arabian peninsula was united under the caliphate in Medina. Once the rebellions had been quelled, Abu Bakr began a war of conquest. In just a few short decades, his campaigns led to one of the largest empires in history. Muslim armies conquered most of Arabia by 633, followed by north Africa, Mesopotamia, and Persia, significantly shaping the history of the world through the spread of Islam. Abu Bakr nominated Umar as his successor on his deathbed. Umar ibn Khattab, the second caliph, was killed by a Persian named Piruz Nahavandi. Umar’s successor, Uthman Ibn Affan, was elected by a council of electors (Majlis). Uthman was killed by members of a disaffected group. Ali then took control, but was not universally accepted as caliph by the governors of Egypt, and later by some of his own guard. He faced two major rebellions and was assassinated by Abdl-alRahman, a Kharijite. Ali’s tumultuous rule lasted only five years. This period is known as the Fitna, or the first Islamic civil war. The followers of Ali later became the Shi’a minority sect of Islam, which rejects the legitimacy of the first three caliphs. The followers of all four Rashidun caliphs (Abu Bakr, Umar, Uthman, and Ali) became the majority Sunni sect. Under the Rashidun, each region (Sultanate) of the caliphate had its own governor (Sultan). Muawiyah, a relative of Uthman and governor (Wali) of Syria, became one of Ali’s challengers, and after Ali’s assassination managed to overcome the other claimants to the caliphate. Muawiyah transformed the caliphate into a hereditary office, thus founding the Umayyad dynasty. In areas that were previously under Sassanid Persian or Byzantine rule, the caliphs lowered taxes, provided greater local autonomy (to their delegated governors), granted greater religious freedom for Jews and some indigenous Christians, and brought peace to peoples demoralized and disaffected by the casualties and heavy taxation that resulted from the decades of Byzantine-Persian warfare. The Umayyad Caliphate, the second of the four major Arab caliphates established after the death of Muhammad, expanded the territory of the Islamic state to one of the largest empires in history. The Umayyad Caliphate, which emerged after the Rashidun Caliphate collapsed, was characterized by hereditary elections and territory expansion. The Umayyad Caliphate became one of the largest unitary states in history and one of the few states to ever extend direct rule over three continents. When the Abbasid dynasty revolted against the Umayyads and killed many of their ruling family members, a few Umayyads escaped to the Iberian peninsula and founded the Cordoba Caliphate, characterized by peaceful diplomacy, religious tolerance, and cultural flourishing. Al-Andalus: Also known as Muslim Spain or Islamic Iberia, a medieval Muslim territory and cultural domain occupying at its peak most of modern-day Spain and Portugal. Dome of the Rock: A shrine located on the Temple Mount in the Old City of Jerusalem. Umayyad Caliphate: The second of the four major Arab caliphates established after the death of Muhammad. The Umayyad Caliphate was the second of the four major Arab caliphates established after the death of Muhammad. This caliphate was centered on the Umayyad dynasty, hailing from Mecca. The Umayyad family had first come to power under the third caliph, Uthman ibn Affan (r. 644–656), but the Umayyad regime was founded by Muawiya ibn Abi Sufyan, long-time governor of Syria, after the end of the First Muslim Civil War in 661 CE. Syria remained the Umayyads’ main power base thereafter, and Damascus was their capital. 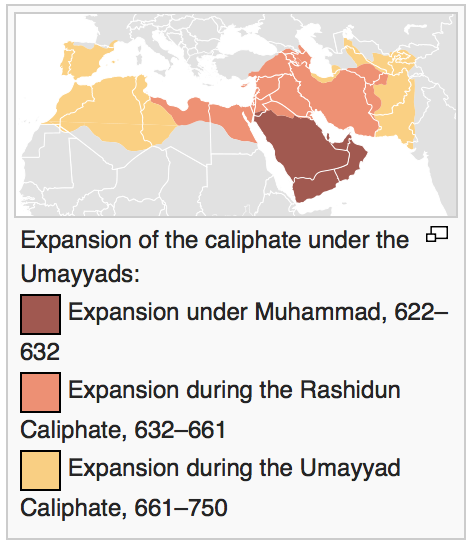 Under the Umayyads, the caliphate territory grew rapidly. The Islamic Caliphate became one of the largest unitary states in history, and one of the few states to ever extend direct rule over three continents (Africa, Europe, and Asia). The Umayyads incorporated the Caucasus, Transoxiana, Sindh, the Maghreb, and the Iberian Peninsula ( Al-Andalus ) into the Muslim world. At its greatest extent, the Umayyad Caliphate covered 5.79 million square miles and included 62 million people (29% of the world’s population), making it the fifth largest empire in history in both area and proportion of the world’s population. Although the Umayyad Caliphate did not rule all of the Sahara, nomadic Berber tribes paid homage to the caliph. However, although these vast areas may have recognized the supremacy of the caliph, de facto power was in the hands of local sultans and emirs. The Umayyad dynasty was not universally supported within the Muslim community for a variety of reasons, including their hereditary election and suggestions of impious behavior. Some Muslims felt that only members of Muhammad’s Banu Hashim clan or those of his own lineage, such as the descendants of Ali, should rule. Some Muslims thought that Umayyad taxation and administrative practices were unjust. While the non-Muslim population had autonomy, their judicial matters were dealt with in accordance with their own laws and by their own religious heads or their appointees. Non-Muslims paid a poll tax for policing to the central state. Muhammad had stated explicitly during his lifetime that each religious minority should be allowed to practice its own religion and govern itself, and the policy had on the whole continued. There were numerous rebellions against the Umayyads, as well as splits within the Umayyad ranks, which notably included the rivalry between Yaman and Qays. Allegedly, The Sunnis killed Ali’s son Hussein and his family at the Battle of Karbala in 680, solidifying the Shi’a-Sunni split. Eventually, supporters of the Banu Hashim and the supporters of the lineage of Ali united to bring down the Umayyads in 750. However, the Shiʻat ʻAlī, “the Party of Ali,” were again disappointed when the Abbasid dynasty took power, as the Abbasids were descended from Muhammad’s uncle `Abbas ibn `Abd al-Muttalib, and not from Ali. The Abbasid victors desecrated the tombs of the Umayyads in Syria, sparing only that of Umar II, and most of the remaining members of the Umayyad family were tracked down and killed. When Abbasids declared amnesty for members of the Umayyad family, eighty gathered to receive pardons, and all were massacred. One grandson of Hisham, Abd al-Rahman I, survived and established a kingdom in Al-Andalus (Moorish Iberia), proclaiming his family to be the Umayyad Caliphate revived. The revival of the Umayyad Caliphate in Al-Andalus (what would become modern Spain) was called the Caliphate of Córdoba, which lasted until 1031. The period was characterized by an expansion of trade and culture, and saw the construction of masterpieces of al-Andalus architecture. The caliphate enjoyed increased prosperity during the 10th century. Abd-ar-Rahman III united al-Andalus and brought the Christian kingdoms of the north under control through force and diplomacy. 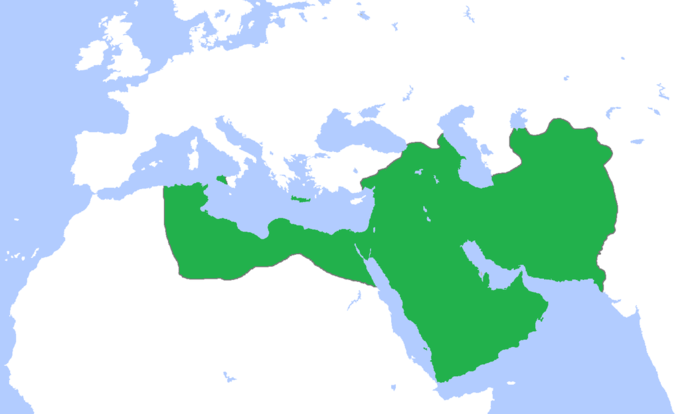 Abd-ar-Rahman stopped the Fatimid advance into caliphate land in Morocco and al-Andalus. This period of prosperity was marked by increasing diplomatic relations with Berber tribes in north Africa, Christian kings from the north, and France, Germany, and Constantinople. Córdoba was the cultural and intellectual center of al-Andalus. Mosques, such as the Great Mosque, were the focus of many caliphs’ attention. The caliph’s palace, Medina Azahara, was on the outskirts of the city, and had many rooms filled with riches from the East. The library of Al-Ḥakam II was one of the largest libraries in the world, housing at least 400,000 volumes, and Córdoba possessed translations of ancient Greek texts into Arabic, Latin and Hebrew. During the Umayyad Caliphate period, relations between Jews and Arabs were cordial; Jewish stonemasons helped build the columns of the Great Mosque. Al-Andalus was subject to eastern cultural influences as well. The musician Ziryab is credited with bringing hair and clothing styles, toothpaste, and deodorant from Baghdad to the Iberian peninsula. Advances in science, history, geography, philosophy, and language occurred during the Umayyad Caliphate as well. Mosque: Interior of the Mezquita (Mosque), one of the finest examples of Umayyad architecture in Spain. The Umayyad caliphate was marked both by territorial expansion and by the administrative and cultural problems that such expansion created. Despite some notable exceptions, the Umayyads tended to favor the rights of the old Arab families, and in particular their own, over those of newly converted Muslims (mawali). Therefore, they held to a less universalist conception of Islam than did many of their rivals. During the period of the Umayyads, Arabic became the administrative language, in which state documents and currency were issued. Mass conversions brought a large influx of Muslims to the caliphate. The Umayyads also constructed famous buildings such as the Dome of the Rock at Jerusalem and the Umayyad Mosque at Damascus. According to one common view, the Umayyads transformed the caliphate from a religious institution (during the Rashidun) to a dynastic one. However, the Umayyad caliphs do seem to have understood themselves as the representatives of God on Earth. The Umayyads have met with a largely negative reception from later Islamic historians, who have accused them of promoting a kingship (mulk, a term with connotations of tyranny) instead of a true caliphate (khilafa). In this respect it is notable that the Umayyad caliphs referred to themselves not as khalifat rasul Allah (“successor of the messenger of God,” the title preferred by the tradition), but rather as khalifat Allah (“deputy of God”). Many Muslims criticized the Umayyads for having too many non-Muslim, former Roman administrators in their government. St. John of Damascus was also a high administrator in the Umayyad administration. As the Muslims took over cities, they left the people’s political representatives and the Roman tax collectors and administrators. The people’s political representatives calculated and negotiated taxes. The central government and the local governments got paid respectively for the services they provided. Many Christian cities used some of the taxes to maintain their churches and run their own organizations. Later, the Umayyads were criticized by some Muslims for not reducing the taxes of the people who converted to Islam. In the years following the Prophet Muhammad’s death, the expansion of Islam was carried out by his successor caliphates, who increased the territory of the Islamic state and sought converts from both polytheistic and monotheistic religions. Discuss the spread of Islam and identify how the caliphs maintained authority over conquered territories. The expansion of the Arab Empire in the years following the Prophet Muhammad ‘s death led to the creation of caliphates, who occupied a vast geographical area and sought converts to Islamic faith. The people of the Islamic world created numerous sophisticated centers of culture and science with far-reaching mercantile networks, travelers, scientists, hunters, mathematicians, doctors, and philosophers. Historians distinguish between two separate strands of converts of the time. One is animists and polytheists of tribal societies of the Arabian Peninsula and the Fertile crescent; the other is the monotheistic populations of the Middle Eastern agrarian and urbanized societies. The Arab conquerors generally respected the traditional middle-Eastern pattern of religious pluralism with regard to the conquered populations, respecting the practice of other faiths in Arab territory, although widespread conversions to Islam came about as a result of the breakdown of historically religiously organized societies. Zoroastrianism: an ancient Iranian religion and religious philosophy that arose in the eastern ancient Persian Empire, when the religious philosopher Zoroaster simplified the pantheon of early Iranian gods into two opposing forces. Imam: An Islamic leadership position, most commonly in the context of a worship leader of a mosque and Sunni Muslim community. The expansion of the Arab Empire in the years following the Prophet Muhammad’s death led to the creation of caliphates occupying a vast geographical area. Conversion to Islam was boosted by missionary activities, particularly those of Imams, who easily intermingled with local populace to propagate religious teachings. These early caliphates, coupled with Muslim economics and trading and the later expansion of the Ottoman Empire, resulted in Islam’s spread outwards from Mecca towards both the Atlantic and Pacific oceans and the creation of the Muslim world. Trading played an important role in the spread of Islam in several parts of the world, notably southeast Asia. Muslim dynasties were soon established and subsequent empires such as those of the Abbasids, Fatimids, Almoravids, Seljukids, and Ajurans, Adal and Warsangali in Somalia, Mughals in India, Safavids in Persia, and Ottomans in Anatolia were among the largest and most powerful in the world. The people of the Islamic world created numerous sophisticated centers of culture and science with far-reaching mercantile networks, travelers, scientists, hunters, mathematicians, doctors, and philosophers, all contributing to the Golden Age of Islam. Islamic expansion in South and East Asia fostered cosmopolitan and eclectic Muslim cultures in the Indian subcontinent, Malaysia, Indonesia, and China. Within the first century of the establishment of Islam upon the Arabian Peninsula and the subsequent rapid expansion of the Arab Empire during the Muslim conquests, one of the most significant empires in world history was formed. For the subjects of this new empire, formerly subjects of the greatly reduced Byzantine and obliterated Sassanid empires, not much changed in practice. The objective of the conquests was of a practical nature more than anything else, as fertile land and water were scarce in the Arabian Peninsula. A real Islamization therefore only came about in the subsequent centuries. Only in subsequent centuries, with the development of the religious doctrine of Islam and with that the understanding of the Muslim Ummah, did mass conversion take place. The new understanding by the religious and political leadership led in many cases to a weakening or breakdown of the social and religious structures of parallel religious communities such as Christians and Jews. With the weakening of many churches, for example, and with the favoring of Islam and the migration of substantial Muslim Turkish populations into the areas of Anatolia and the Balkans, the “social and cultural relevance of Islam” were enhanced and a large number of peoples were converted. During the Abbasid Caliphate, expansion ceased and the central disciplines of Islamic philosophy, theology, law, and mysticism became more widespread, and the gradual conversions of the populations within the empire occurred. Significant conversions also occurred beyond the extents of the empire, such as that of the Turkic tribes in Central Asia and peoples living in regions south of the Sahara in Africa through contact with Muslim traders active in the area and Sufi orders. In Africa it spread along three routes—across the Sahara via trading towns such as Timbuktu, up the Nile Valley through the Sudan up to Uganda, and across the Red Sea and down East Africa through settlements such as Mombasa and Zanzibar. These initial conversions were of a flexible nature. The Arab-Muslim conquests followed a general pattern of nomadic conquests of settled regions, whereby conquering peoples became the new military elite and reached a compromise with the old elites by allowing them to retain local political, religious, and financial authority. Peasants, workers, and merchants paid taxes, while members of the old and new elites collected them. The Great Mosque of Kairouan: The Great Mosque of Kairouan, founded in 670 CE by the Arab general and conqueror Uqba Ibn Nafi, is the oldest mosque in western Islamic lands and represents an architectural symbol of the spread of Islam in North Africa, situated in Kairouan, Tunisia. The Arab conquerors did not repeat the mistake made by the Byzantine and Sasanian empires, who had tried and failed to impose an official religion on subject populations, which had caused resentments that made the Muslim conquests more acceptable to them. Instead, the rulers of the new empire generally respected the traditional middle-Eastern pattern of religious pluralism, which was not one of equality but rather of dominance by one group over the others. After the end of military operations, which involved the sacking of some monasteries and confiscation of Zoroastrian fire temples in Syria and Iraq, the early caliphate was characterized by religious tolerance, and people of all ethnicities and religions blended in public life. Before Muslims were ready to build mosques in Syria, they accepted Christian churches as holy places and shared them with local Christians. In Iraq and Egypt, Muslim authorities cooperated with Christian religious leaders. Numerous churches were repaired and new ones built during the Umayyad era. Some non-Muslim populations did experience persecution, however. After the Muslim conquest of Persia, Zoroastrians were given dhimmi (non-Muslim) status and subjected to persecutions; discrimination and harassment began in the form of sparse violence. Zoroastrians were made to pay an extra tax called Jizya; if they failed, they were killed, enslaved, or imprisoned. Those paying Jizya were subjected to insults and humiliation by the tax collectors. Zoroastrians who were captured as slaves in wars were given their freedom if they converted to Islam. Abbasid leadership cultivated intellectual, cultural, and scientific developments in the Islamic Golden Age. The Islamic Golden Age started with the rise of Islam and establishment of the first Islamic state in 622. The introduction of paper in the 10th century enabled Islamic scholars to easily write manuscripts; Arab scholars also saved classic works of antiquity by translating them into various languages. The Arabs assimilated the scientific knowledge of the civilizations they had overrun, including the ancient Greek, Roman, Persian, Chinese, Indian, Egyptian, and Phoenician civilizations. Scientists advanced the fields of algebra, calculus, geometry, chemistry, biology, medicine, and astronomy. Many forms of art flourished during the Islamic Golden Age, including ceramics, metalwork, textiles, illuminated manuscripts, woodwork, and calligraphy. calligraphy: A visual art related to writing—the design and execution of lettering with a broad tip instrument or brush in one stroke. arabesque: A form of artistic decoration consisting of surface decorations based on rhythmic linear patterns of scrolling and interlacing foliage, tendrils, and other elements. Averroës: A medieval Andalusian polymath famous for his translations and commentaries of Aristotle. The Islamic Golden Age refers to a period in the history of Islam, traditionally dated from the 8th century to the 13th century, during which much of the historically Islamic world was ruled by various caliphates and science, economic development, and cultural works flourished. This period is traditionally understood to have begun during the reign of the Abbasid caliph Harun al-Rashid (786–809) with the inauguration of the House of Wisdom in Baghdad, where scholars from various parts of the world with different cultural backgrounds were mandated to gather and translate all of the world’s classical knowledge into the Arabic language. The end of the age is variously given as 1258 with the Mongolian Sack of Baghdad, or 1492 with the completion of the Christian Reconquista of the Emirate of Granada in Al-Andalus, Iberian Peninsula. During the Golden Age, the major Islamic capital cities of Baghdad, Cairo, and Córdoba became the main intellectual centers for science, philosophy, medicine, and education. The government heavily patronized scholars, and the best scholars and notable translators, such as Hunayn ibn Ishaq, had salaries estimated to be the equivalent of those of professional athletes today. The School of Nisibis and later the School of Edessa became centers of learning and transmission of classical wisdom. The House of Wisdom was a library, translation institute, and academy, and the Library of Alexandria and the Imperial Library of Constantinople housed new works of literature. Nestorian Christians played an important role in the formation of Arab culture, with the Jundishapur hospital and medical academy prominent in the late Sassanid, Umayyad, and early Abbasid periods. Notably, eight generations of the Nestorian Bukhtishu family served as private doctors to caliphs and sultans between the 8th and 11th centuries. With the introduction of paper, information was democratized and it became possible to make a living from simply writing and selling books. The use of paper spread from China into Muslim regions in the 8th century, and then to Spain (and then the rest of Europe) in the 10th century. Paper was easier to manufacture than parchment and less likely to crack than papyrus, and could absorb ink, making it difficult to erase and ideal for keeping records. Islamic paper makers devised assembly-line methods of hand-copying manuscripts to turn out editions far larger than any available in Europe for centuries. The best known fiction from the Islamic world is The Book of One Thousand and One Nights, which took form in the 10th century and reached its final form by the 14th century, although the number and type of tales vary. Painting of the Ali Baba story in The Book of One Thousand and One Nights by Maxfield Parrish: The introduction of paper in the 10th century enabled Islamic scholars to easily write manuscripts, including The Book of One Thousand and One Nights. Arab scholars also saved classic works of antiquity by translating them into various languages. Christians (particularly Nestorian Christians) contributed to the Arab Islamic civilization during the Ummayad and the Abbasid periods by translating works of Greek philosophers to Syriac and then to Arabic. During the 4th through the 7th centuries, scholarly work in the Syriac and Greek languages was either newly initiated or carried on from the Hellenistic period. Many classic works of antiquity might have been lost if Arab scholars had not translated them into Arabic and Persian and later into Turkish, Hebrew, and Latin. Islamic scholars also absorbed ideas from China and India, and in turn Arabic philosophic literature contributed to the development of modern European philosophy. Ibn Rushd, also known by his Latinized name Averroës (April 14, 1126–December 10, 1198), was an Al-Andalus Muslim polymath, a master of Aristotelian philosophy, Islamic philosophy, Islamic theology, Maliki law and jurisprudence, logic, psychology, politics, Andalusian classical music theory, medicine, astronomy, geography, mathematics, physics, and celestial mechanics. Averroes was born in Córdoba, Al-Andalus, present-day Spain, and died in Marrakesh, present-day Morocco. The 13th-century philosophical movement based on Averroes’ work is called Averroism. Both Ibn Rushd and the scholar Ibn Sina played a major role in saving the works of Aristotle, whose ideas came to dominate the non-religious thought of the Christian and Muslim worlds. Ibn Rushd has been described as the “founding father of secular thought in Western Europe.” He tried to reconcile Aristotle’s system of thought with Islam. According to him, there is no conflict between religion and philosophy; rather they are different ways of reaching the same truth. He believed in the eternity of the universe. Ibn Ruhd also held that the soul is divided into two parts, one individual and one divine; while the individual soul is not eternal, all humans at the basic level share one and the same divine soul. The Arabs assimilated the scientific knowledge of the civilizations they had conquered, including the ancient Greek, Roman, Persian, Chinese, Indian, Egyptian, and Phoenician civilizations. Scientists recovered the Alexandrian mathematical, geometric, and astronomical knowledge, such as that of Euclid and Claudius Ptolemy. Persian scientist Muhammad ibn Mūsā al-Khwārizmī significantly developed algebra in in his landmark text, Kitab al-Jabr wa-l-Muqabala, from which the term “algebra” is derived. The term “algorithm” is derived from the name of the scholar al-Khwarizmi, who was also responsible for introducing the Arabic numerals and Hindu-Arabic numeral system beyond the Indian subcontinent. In calculus, the scholar Alhazen discovered the sum formula for the fourth power, using a method readily generalizable to determine the sum for any integral power. He used this to find the volume of a paraboloid. Medicine was a central part of medieval Islamic culture. Responding to circumstances of time and place, Islamic physicians and scholars developed a large and complex medical literature exploring and synthesizing the theory and practice of medicine. Islamic medicine was built on tradition, chiefly the theoretical and practical knowledge developed in India, Greece, Persia, and Rome. Islamic scholars translated their writings from Syriac, Greek, and Sanskrit into Arabic and then produced new medical knowledge based on those texts. In order to make the Greek tradition more accessible, understandable, and teachable, Islamic scholars organized the Greco-Roman medical knowledge into encyclopedias. 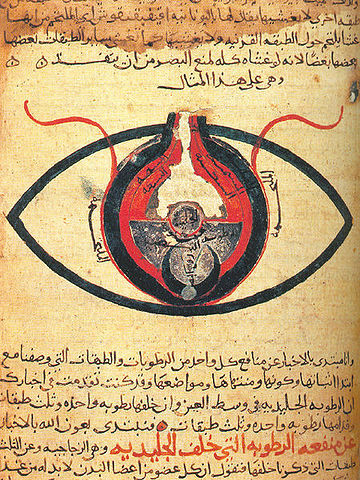 The eye, according to Hunain ibn Ishaq: Scholars developed large encyclopedias of medical knowledge during the Islamic Golden Age, such as this one from a manuscript dated circa 1200. Ceramics, glass, metalwork, textiles, illuminated manuscripts, and woodwork flourished during the Islamic Golden Age. Manuscript illumination became an important and greatly respected art, and portrait miniature painting flourished in Persia. Calligraphy, an essential aspect of written Arabic, developed in manuscripts and architectural decoration. Typically, though not entirely, Islamic art depicts nature patterns and Arabic calligraphy, rather than figures, because many Muslims feared that the depiction of the human form is idolatry and thereby a sin against God, forbidden in the Quran. There are repeating elements in Islamic art, such as the use of geometrical floral or vegetal designs in a repetition known as the arabesque. The arabesque in Islamic art is often used to symbolize the transcendent, indivisible, and infinite nature of God. Mistakes in repetitions may be intentionally introduced as a show of humility by artists who believe only God can produce perfection, although this theory is disputed. 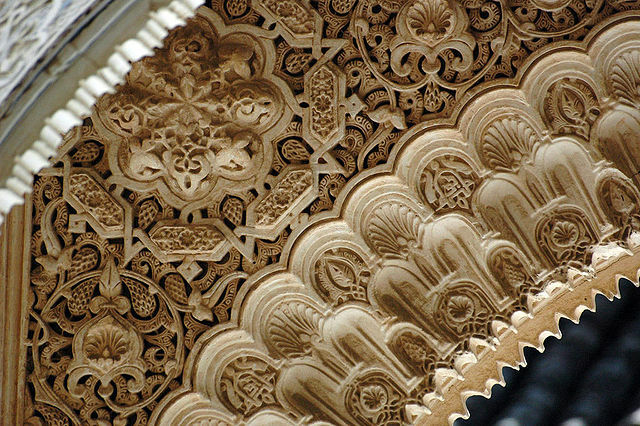 Detail of arabesque decoration at the Alhambra in Spain: Arabesque in Islamic art is often used to symbolize the transcendent, indivisible, and infinite nature of God. The traditional instrument of the Arabic calligrapher is the qalam, a pen made of dried reed or bamboo. Qalam ink is often in color, and chosen such that its intensity can vary greatly, so that the greater strokes of the compositions can be very dynamic in their effect. Islamic calligraphy is applied on a wide range of decorative mediums other than paper, such as tiles, vessels, carpets, and inscriptions. Before the advent of paper, papyrus and parchment were used for writing. Coins were another support for calligraphy. Beginning in 692, the Islamic caliphate reformed the coinage of the Near East by replacing visual depiction with words. This was especially true for dinars, or gold coins of high value, which were inscribed with quotes from the Quran. By the 10th century, the Persians, who had converted to Islam, began weaving inscriptions on elaborately patterned silks. These calligraphic-inscribed textiles were so precious that Crusaders brought them to Europe as prized possessions. A notable example is the Suaire de Saint-Josse, used to wrap the bones of St. Josse in the abbey of St. Josse-sur-Mer near Caen in northwestern France. There were many advances in architectural construction, and mosques, tombs, palaces, and forts were inspired by Persian and Byzantine architecture. Islamic mosaic art anticipated principles of quasicrystalline geometry, which would not be discovered for 500 more years. This art used symmetric polygonal shapes to create patterns that can continue indefinitely without repeating. These patterns have even helped modern scientists understand quasicrystals at the atomic levels. Mosque Archway: Geometric patterns: an archway in the Sultan’s lodge in the Ottoman Green Mosque in Bursa, Turkey (1424), its girih strapwork forming 10-point stars and pentagons. The Abbasid Caliphate was the third of the Islamic caliphates to succeed the Islamic prophet Muhammad in 750 CE, and ruled over a large, flourishing empire for three centuries. The Abbasids overthrew the Umayyad dynasty in 750 CE, supporting the mawali, or non-Arab Muslims, by moving the capital to Baghdad in 762 CE. The Persian bureaucracy slowly replaced the old Arab aristocracy as the Abbasids established the new positions of vizier and emir to delegate their central authority. The Abbasids maintained an unbroken line of caliphs for over three centuries, consolidating Islamic rule and cultivating great intellectual and cultural developments in the Middle East in the Golden Age of Islam. The Fatimid dynasty broke from the Abbasids in 909 and created separate line of caliphs in Morocco, Algeria, Tunisia, Libya, Egypt, and Palestine until 1171 CE. Abbasid control eventually disintegrated, and the edges of the empire declared local autonomy. Though lacking in political power, the dynasty continued to claim authority in religious matters until after the Ottoman conquest of Egypt in 1517.
vizier: A high-ranking political advisor or minister in the Muslim world. emir: A title of high office used in a variety of places in the Muslim world. Fatimid dynasty: A Shi’a Islamic caliphate that spanned a large area of North Africa, from the Red Sea in the east to the Atlantic Ocean in the west; they claimed lineage from Muhammad’s daughter. 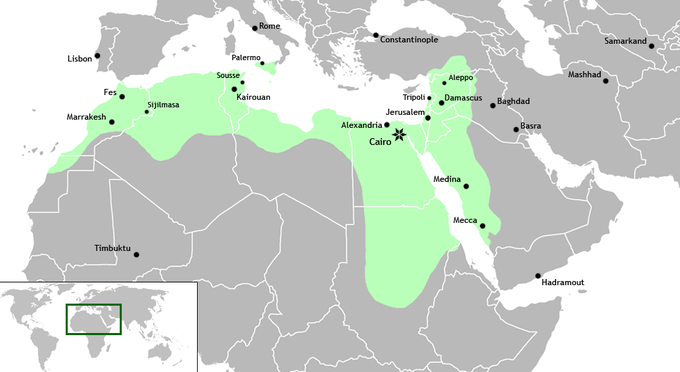 The Umayyad dynasty was overthrown by another family of Meccan origin, the Abbasids, in 750 CE. The Abbasids distinguished themselves from the Umayyads by attacking their moral character and administration. In particular, they appealed to non-Arab Muslims, known as mawali, who remained outside the kinship-based society of the Arabs and were perceived as a lower class within the Umayyad empire. The Abbasid dynasty descended from Muhammad ‘s youngest uncle, Abbas ibn Abd al-Muttalib (566–653 CE), from whom the dynasty takes its name. Muhammad ibn ‘Ali, a great-grandson of Abbas, began to campaign for the return of power to the family of Muhammad, the Hashimites, in Persia during the reign of Umar II, an Umayyad caliph who ruled from 717–720 CE. The Abbasids moved the empire’s capital from Damascus, in modern-day Syria, to Baghdad, in modern-day Iraq, in 762 CE. The Abbasids had depended heavily on the support of Persians in their overthrow of the Umayyads, and the geographic power shift appeased the Persian mawali support base. Abu al-‘Abbas’s successor, Al-Mansur, welcomed non-Arab Muslims to his court. While this helped integrate Arab and Persian cultures, it alienated the Arabs who had supported the Abbasids in their battles against the Umayyads. The Abbasids established the new position of vizier to delegate central authority, and delegated even greater authority to local emirs. As the viziers exerted greater influence, many Abbasid caliphs were relegated to a more ceremonial role as Persian bureaucracy slowly replaced the old Arab aristocracy. The Abbasids, who ruled from Baghdad, had an unbroken line of caliphs for over three centuries, consolidating Islamic rule and cultivating great intellectual and cultural developments in the Middle East in the Golden Age of Islam. By 940 CE, however, the power of the caliphate under the Abbasids began waning as non-Arabs gained influence and the various subordinate sultans and emirs became increasingly independent. Map of the Abbasid Caliphate at its greatest extent, c. 850 CE: The Abbasid dynasty ruled as caliphs from their capital in Baghdad, in modern Iraq, after taking over authority of the Muslim empire from the Umayyads in 750 CE. The Abbasid leadership worked to overcome the political challenges of a large empire with limited communication in the last half of the 8th century (750–800 CE). While the Byzantine Empire was fighting Abbasid rule in Syria and Anatolia, the caliphate’s military operations were focused on internal unrest. Local governors had begun to exert greater autonomy, using their increasing power to make their positions hereditary. Simultaneously, former supporters of the Abbasids had broken away to create a separate kingdom around Khorosan in northern Persia. Several factions left the empire to exercise independent authority. In 793 CE, the Shi’a (also called Shi’ite) dynasty of Idrisids gained authored over Fez in Morocco. The Berber Kharijites set up an independent state in North Africa in 801 CE. A family of governors under the Abbasids became increasingly independent until they founded the Aghlabid Emirate in the 830s. Within 50 years, the Idrisids in the Maghreb, the Aghlabids of Ifriqiya, and the Tulunids and Ikshidids of Misr became independent in Africa. By the 860s governors in Egypt set up their own Tulunid Emirate, so named for its founder Ahmad ibn Tulun, starting a dynastic rule separate from the caliph. In the eastern territories, local governors decreased their ties to the central Abbasid rule. The Saffarids of Herat and the Samanids of Bukhara seceded in the 870s to cultivate a more Persian culture and rule. The Tulinid dynasty managed Palestine, the Hijaz, and parts of Egypt. By 900 CE, the Abbasids controlled only central Mesopotamia, and the Byzantine Empire began to reconquer western Anatolia. Several factions challenged the Abbasids’ claims to the caliphate. Most Shi’a Muslims had supported the Abbasid war against the Umayyads because the Abbasids claimed legitimacy with their familial connection to Muhammad, an important issue for Shi’a. However, once in power, the Abbasids embraced Sunni Islam and disavowed any support for Shi’a beliefs. The Shiʻa Ubayd Allah al-Mahdi Billah of the Fatimid dynasty, who claimed descent from Muhammad’s daughter, declared himself Caliph in 909 CE and created a separate line of caliphs in North Africa. The Fatimid caliphs initially controlled Morocco, Algeria, Tunisia, and Libya, and they expanded for the next 150 years, taking Egypt and Palestine. The Abbasid dynasty finally challenged Fatimid rule, limiting them to Egypt. By the 920s, a Shi’a sect that only recognized the first five Imams and could trace its roots to Muhammad’s daughter Fatima, took control of Idrisi and then Aghlabid domains. This group advanced to Egypt in 969 CE, establishing their capital near Fustat in Cairo, which they built as a bastion of Shi’a learning and politics. By 1000 CE, they had become the chief political and ideological challenge to Abbasid Sunni Islam. At this point, the Abbasid dynasty had fragmented into several governorships that were mostly autonomous, although they official recognized caliphal authority from Baghdad. The caliph himself was under “protection” of the Buyid Emirs, who possessed all of Iraq and western Iran, and were quietly Shi’a in their sympathies. The Fatimid Caliphate at its height, c. 969 CE: The Fatimid dynasty broke from the Abbasids in 909 CE and created separate lines of caliphs in Morocco, Algeria, Tunisia, Libya, Egypt, and Palestine until 1171 CE. Outside Iraq, all the autonomous provinces slowly became states with hereditary rulers, armies, and revenues. They operated under only nominal caliph authority, with emirs ruling their own provinces from their own capitals. Mahmud of Ghazni took the title of “sultan,” instead of “emir,” signifying the Ghaznavid Empire’s independence from caliphal authority, despite Mahmud’s ostentatious displays of Sunni orthodoxy and ritual submission to the caliph. In the 11th century, the loss of respect for the caliphs continued, as some Islamic rulers no longer mentioned the caliph’s name in the Friday khutba, or struck it off their coinage. The political power of the Abbasids largely ended with the rise of the Buyids and the Seljuq Turks in 1258 CE. Though lacking in political power, the dynasty continued to claim authority in religious matters until after the Ottoman conquest of Egypt in 1517.